1. Begin by removing the shells and vein from the shrimp. Rinse, then dry them, and dust with the blacken and salt. Place 1 tablespoon of butter and oil in a Teflon pan, and turn to high. Cook the shrimp about 2 minutes on each side. Cook them just long enough so that they turn pink, otherwise they'll be real tough. Set these in a bowl to cool while you cook the vegetables. 2. Mince the peppers and onions. Place 1 tablespoon of butter and oil in a pan, and turn to medium / high. Cook the vegetables only long enough to soften them. Then place them in a bowl to cool. 3. Place the meat in a large bowl. Mix the milk and bread crumbs in a small bowl, then add it to the meat. Add all of the other ingredients and mix it well with our hands. 4. Lay out a sheet of parchment paper that's about 18" square (this will help later, when you're wrapping the meat). Make a lattice out of the bacon, it's a lot easier for you to click on the picture than for me to try to talk you through it. Make sure you've got about a 14" square of the bacon lattice. 5. Place the meat in the center 3rd of the bacon lattice, and make a well down the center for the shrimp. 6. Place the shrimp in the well, on edge. If you've got any leftover, I'm sure you can figure out what I did with them. 7. Bring the sides of the loaf over the top, to cover the shrimp, doing your best to keep the shrimp in the middle of the loaf. 8. 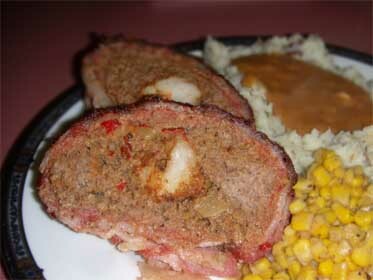 Use the parchment paper to roll the bacon over top of the meatloaf. When I made this, I covered it with a second piece of parchment paper, and set it in the refrigerator until I was ready to cook. I actually made it up to this point fairly early in the morning. 10. Mix up the blacken and dark brown sugar to make a "rub". 11. Set the meat on the un-lined pan bottom, placing the seam form the bacon lattice on the bottom. It was a little hard to handle, so I used the parchment paper to help me roll the meatloaf onto the rack., Rub the "rub" into the top of the meat, and put it in the oven. By the pictures you'll note that I used aluminum foil and a rack in the pan. I screwed up! The foil turned the pan into an "air pan", and the bottom of the roast didn't get hot enough. The end result was the bacon, on the bottom of the roast was still raw when the meatloaf was done. I've bacon wrapped a meatloaf prior to this and it came out fine, but In placed it directly onto the pan. It was a good ides, but not all good ideas are the right ones. 12. Cook for about 1 1/2 hours to an internal temperature of 165 degrees. 13. Set it on a platter to rest for at least 15 minutes before cutting it for service.